"Pa�just what can you do with a grown woman?" Shazzam! 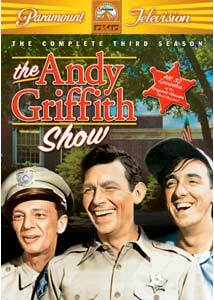 Paramount bows the third season of The Andy Griffith Show in this five DVD set, containing all 32 episodes of this perennial television favorite. Like all successful situation comedies, what makes Mayberry, South Carolina such a special place is the collection of personalities that inhabit this quiet rural community. Sheriff Taylor (Griffith) is an easy going fellow, maintaining order with a fair and friendly attitude, but while he is simple folk and his demeanor is relaxed, by no means is he a man to be fooled with. While it takes an awful lot to get Andy bent out of shape, if there is one man capable of it, it is deputy Barney Fife, whose gung ho, yet well meaning intentions often wind up trying Andy's patience. Barney continues to be the thorn in Andy's side, whether screwing up his policing duties, or by meddling in Andy's personal affairs both with an overzealous approach. Knotts is brilliant, defining the character the way no one else could. Cocky one minute, cowering the next, his bumbling deputy has a genuine affinity for his partner, even if he doesn't know when to call it quits, and his attempts at being a ladies man are simply hilarious. Barney has his confidence tested in Lawman Barney, when a pair of street peddlers flaunt his authority; he gets mixed up with a band of escaped cons in Convicts at Large, and even gets high office to take notice of his service after ticketing the governor's car in Barney and the Governor. His nose for crime has him worried about security in The Bank Job, while guarding prisoners takes on a whole new dimension in The Big House. Barn gets hoodwinked by a sly con artist in Barney's First Car (costarring Waltons grandma, Ellen Corby) plays matchmaker�to Andy's chagrin�in A Wife for Andy, and crashes his way into The Mayberry Band. Son Opie also presents his share of challenges for Andy. When a new kid begins picking on him, Opie must learn to stand up for himself (One-Punch Opie), and another new kid teaches him how to get his way (Opie and the Spoiled Kid) by overacting and throwing hissy fits to get a raise on his allowance. This one has some great Ronny Howard moments. Opie gets his pa in a heap of trouble with the new teacher in Andy Discovers America and even gets Barney jealous when Thelma Lou tries to help the boy out in The Rivals. Aunt Bee has a couple of nice episodes, first going against her usual practical self by wishing for a special birthday gift in The Bed Jacket (which also show's Andy's insensitivity), and Aunt Bee's Medicine Man finds her spirits lifted, literally, when a vendor comes to town. This season is pretty even as far as the quality of episodes go, and there are some great installments here. The opener, Mr. McBeevee, is a perfect example of what makes the show so enjoyable. The episode begins with Andy and Opie sharing a little imaginative play time, (which Barney stumbles in on with riotous results), but when Opie comes home with tales of a man who lives in the tree tops, wears a silver helmet and has twelve extra hands and feet that jingle, Andy and Barney are convinced this is just another of Opie's imaginary playmates, that is until the boy brings home a present given to him by his new friend. Concerned that Opie is using stories to cover up the truth that he has been stealing, Andy gives the boy an ultimatum�either fess up that Mr. McBeevee isn't real, or get a licking�but when Opie insists that he isn't lying, Andy must decide whether he has lost faith in his boy or accept his story, no matter how implausible. Here we have a defining moment in the relationship between father and son. Joanna Moore joins the cast in a number of episodes as Andy's new love interest, Peggy McMillan, but things get off to a rocky start when Andy discovers his new flame comes from a well-to-do family (Andy's Rich Girlfriend), which clashes with his down home country mannerisms. Andy's attentions also spark jealousy from Opie, who tries to interfere with their relationship (Opie's Rival), while Floyd warns Andy that the girl is eyeing him up for marriage (Andy and Opie, Bachelors), and Barney tries to console his partner�a disaster in the making�when the two lovebirds have a spat (Barney Mends a Broken Heart). The third season introduces a few more of the Mayberry townfolk, including fan favorite, Jim Nabors as goofy gas jockey, Gomer Pyle, who appears in a handful of episodes beginning with The Bank Job. Nabors who would get his own spinoff in Gomer Pyle, U.S.M.C. after two seasons. Also making their debut are Aneta Corsaut as Opie's teacher and another love interest for Andy, Helen Crump; Howard Morris as Ernest T. Bass and The Darlings (including Denver Pyle (The Dukes of Hazzard), Margaret Ann Peterson and Doug Dillard) who appear in a pair of episodes. Paramount has judiciously noted on the cover that some of the episodes may not be their original broadcast version, which applies to the lone shortcoming in this set, which is the inclusion of the syndicated version of Here Come the Darlings. This is one of the episodes that fell into the public domain, and is inferior in video quality, and missing its epilogue. This one letdown aside, this is another great collection of episodes the whole family should enjoy. Image Transfer Review: If you've been buying these series sets as they have been released, the video quality is pretty much on par with previous editions. Grading is based on the overwhelming majority of the set, in which greyscale is well balanced, with even midtones and good shadow detail, and whites are bright but not overblown. The image is sharp, without excess enhancement, and detail is crisp with no cross coloration. The exception is The Darlings are Coming which is sourced from an inferior transfer, noteably darker, and with much less sharpness and clarity. With the quality of the rest of the episodes, I can only assume that original elements for this one could not be located. Audio Transfer Review: Mono audio is in good shape. There is no excess sibilance to speak of, and hiss and distortion are limited. There are one or two dropouts across the 13-hour runtime. No complaints in this department. 0 Other Trailer(s) featuring The Brady Bunch, Happy Days, Laverne and Shirley, Mork and Mindy, MacGuyver, Charmed. Extras Review: Like the second season set, original sponsor spots are included as extras, although a few episodes are missing. Andy and various members of the cast (including a dog and a goat) pitch Sanka coffee, various Jell-O flavors, Post Toasties, and Baker's Chocolate Chips. Some of these get pretty imaginative. Each episode has five internal chapters, including one immediately following the opening theme. Episodes are individually available from the menu or with the "Play All" feature. The first disc has front loaded trailers for The Brady Bunch, Happy Days, Laverne and Shirley, Mork and Mindy, MacGuyver and Charmed. A sturdy box (which includes a complete episode list on the back cover) houses the 5 DVDs, which are packaged in three dual Thinpak cases featuring a garage theme. Well golly, it's not hard to see why The Andy Griffith Show has maintained its position as one the most popular sitcoms ever made, and this third season is packed with memorable episodes. Highly recommended. Y'all come back now, y'hear.